It was one of the coldest nights of winter 2009, but the Wisco was sweltering with rock ‘n’ roll. The Goodnight Loving were in from Milwaukee, Screamin’ Cyn Cyn & the Pons were in top form, and the Midwest Beat’s Matt Joyce did a scorching solo set. The only band I’d missed was the Hussy. I’d caught the tail end of their set on three different occasions and was hoping this night would be different. Frustrated, I stomped down the steps, ready to kick the nearest snow bank. That’s when I saw it: a Hussy T-shirt, just my size, drenched in sweat. I almost needed an ice pick to remove it from the sidewalk, but after that, the shirt became my most treasured item of clothing. I wrote in it. I slept in it. I lent it to my friends. The shirt made people laugh, and it started conversations. It got me talking, too, no small feat for someone prone to shyness. Plus, it reminded me to catch the Hussy’s next show — and buy another one of their shirts. For local musicians, merchandise works magic. Not only does it help fans find one another and show off their taste, it allows Madison bands to take their shows on the road. For groups like All Tiny Creatures and the Pons, merch has funded trips to South by Southwest. For others, it has funded recording time in Seattle and tours of Europe. Kurt Baker, the Madison native who fronts the Portland, Maine, pop-punk band the Leftovers, says that merch — as it’s universally called — means food, fuel and other necessities to get from one town to the next. But that’s just the beginning. More and more bands, it seems, are financing their careers with merch rather than mp3s. Irving Azoff, the artist-management magnate who represents Jimmy Buffett and Neil Diamond, explained in a recent New Yorker article that merch sales and third-party sponsorship have virtually replaced record sales in the music industry’s moneymaking model. This shift has benefited bands such as Massachusetts’ Dropkick Murphys, who reportedly make more from merchandise than recordings. Mike Krol, who drums for Whatfor and Time Since Western and until recently worked for the Madison-based design firm Planet Propaganda, says he’s figured out the secret. He did it by observing one of his best friends, the Murphys’ merch buyer. Another Madison-bred band Krol sometimes drums for, Sleeping in the Aviary, have adopted an even wackier approach. They’ve been known to peddle clippings of their hair in Ziploc bags and thrift-store coffee mugs decorated with their faces. Krol’s favorite was a huge pair of pink, one-piece pajamas. Other local groups are upping the ante for creativity and craziness. Masked surf-rockers Knuckel Drager have been making merch awesomeness for years. Darwin Sampson, owner of the Frequency and bassist for Helliphant and Ladybeard, says he’s proud to own one the band’s signature action figures — or fingers, as the case may be. “[It’s] the ‘El Diablo Action Figure,’ which is merely a plastic hand flipping the bird,” he says. Then there’s the gumball dispenser Knuckel Drager’s Matt Villand unveiled at last month’s Melt-Banana show. “It gave out random objects like vampire teeth and plastic rings,” recalls Knuckel Drager bassist Bill Borowski, who helped open the show with his other band, United Sons of Toil. More creations by Villand and his bandmates are available through the Black Cat Printing Company, which creates merch items like posters, T-shirts and, yes, gumball machines for other musicians. Other designers from the area are also using band merch to show off their creative powers. Krol has made baseball jerseys for Icarus Himself, while artists from the recently shuttered art collective Firecracker Studios made hundreds of gig posters over the course of five years. In September, the Project Lodge even hosted an art show of posters custom-made for the Forward Music Festival, submitted by designers from here to Philadelphia. While a designer can spruce up a band’s merch offerings, lots of bands without design pros are trying their hand at creating stuff, too. For Shane O’Neill of the Pons, his electro-meets-comedy venture Shane Shane doubles as an outlet for his craft projects. He even runs an Etsy store when he’s not working on lyrics and dance moves. At Shane Shane shows, O’Neill dresses up as a giant soft-serve cone, then heads to his merch table to distribute free, ice-cream-themed buttons and stickers. This gets people interested in buying his T-shirts, and it gets them talking about the show. Even venues are getting involved. At the Frequency, a slew of gig posters, most for local bands, covers the stage room from floor to ceiling. Band stickers, ticket stubs and guitar picks adorn the bar. Sampson says these decorations have provided an instant conversation piece for customers and have given his staff and bandmates a chance to reminisce. Plus, when bands play there, they have a way to leave their mark. Near the Frequency’s jukebox and Arkanoid machine are glass cases filled with all sorts of kitschy oddities: a can of “meat” sold by the band Human Aftertaste, an autographed photo of Britney Spears a Frequency employee found during Hippie Christmas, a Mozart action figure and much more. These items pay tribute to Madison showgoers’ merch-buying obsessions while mocking them with a smile and a wink. For fans, there’s fun to be had in building their own shrines of merch. The process breaks down the wall between performer and audience, especially when a merch-table visit leads to a conversation. Think of a purchase as a way of thanking a band for rocking, says Jake Shut of the local Crustacean music label. On the flip side, merch tables are a place for musicians to thank fans for coming out to the show. For Jess Northup of Gold and Shooter Grey Suede, two Chicago bands that play Madison regularly, merch tables have taken the form of a bake sale, with brownies and coffee from bandmate Mike McSherry’s bean-roasting business. There’s an added benefit as well: The more enticing the merch table, the less isolated the band feels, especially if it’s far from home. The Leftovers’ Kurt Baker even suggests that bands bring cameras to their merch tables to keep the conversation going after the show’s over. Dressing up the merch is key. 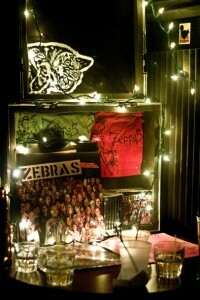 Local bands like Zebras and Underculture have used Christmas lights to add flash to their T-shirts and recordings, even in the middle of summer. Underculture drummer/vocalist Nate Onsrud says the lights aren’t about holiday cheer. They’re about drawing people’s eyes across a crowded room and into a suitcase packed with their newest offerings. Meanwhile, All Tiny Creatures offer this tip for bands in the merchandising business: Go minimal. “A great merch table isn’t crowded, and everything is clearly labeled,” says Andrew Fitzpatrick, the band’s guitarist. The right attitude is probably the most important thing, says multi-instrumentalist Thomas Wincek, who’s also a member of Volcano Choir and Collections of Colonies of Bees. “In the best-case scenario, merchandise can be used to further a connection people may have with a band. In the worst case, it’s used to cash in on an image and seen as almost more important than the experience of the music,” he argues. No matter what, merch can help musicians express their sense of humor, which helps them with the all-important human touch. This entry was posted in Featured, Music and tagged Isthmus, journalism, music by JessicaLSteinhoff. Bookmark the permalink.